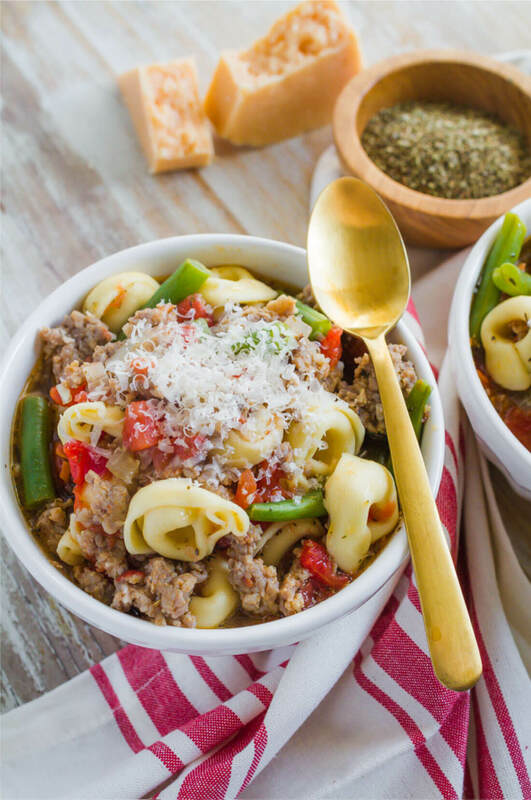 This Slow Cooker Tortellini Soup is one your family will love!! A year or so ago I got this recipe from my cute, sassy friend Becca. I wasn’t sure how my family would take to it because it’s a) soup (I loooove soup but my boys? Not so much) and b) tortellini and sausage…. I just didn’t know if it would fly. On one particular cold, rainy day I decided it was worth a shot. They LOVED it so so much! It’s now my go to for chilly days. And I’m all about slow cooker recipes. They make my life so much easier if I can get my act together ahead of time. I also love tortellini recipes – like Baked Tortellini and Italian Tortellini. Every time I make this one, I wonder why I don’t make it more often. When my Dad passed away a few weeks ago, a few ladies from church brought over a big, huge bowl full of this soup. It was the perfect comfort food. Their recipe called for zucchini and carrot- a little different from this one. I think next time I’ll add some and see if the rest of my family is still on board. 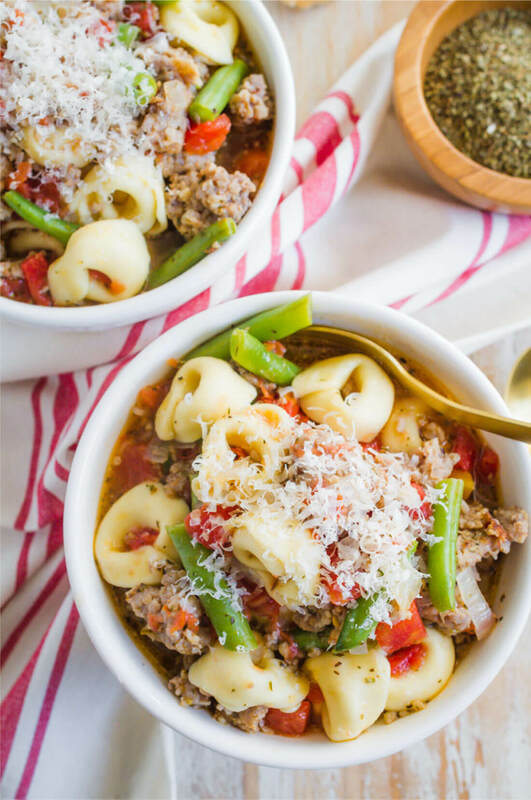 Slow Cooker Tortellini Soup is my go-to for chilly days - it’s hearty, delicious and so incredibly easy! Crumble 1 lb mild sausage and place in slow cooker. *Sausage with casing can be used, just remove casing from the sausage and crumble. Add tomatoes, diced onions, frozen green beans and seasoning. Add 1 box of chicken stock and cook on high for 1 hour. Add cheese tortellini and cook for an additional 1/2 hour. Serve topped with fresh shredded Parmesan cheese. Made the tortellini sausage soup tonight & everyone loved it! Thanks for the recipe. 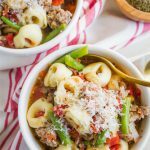 I made the tortellini sausage soup tonight for dinner and my whole family loved it! It was so good! Thanks for sharing the recipe. I love this recipe but have never tried it in the crockpot! Thx for sharing! Does anyone know if you cook the sausage first? These all look so good! 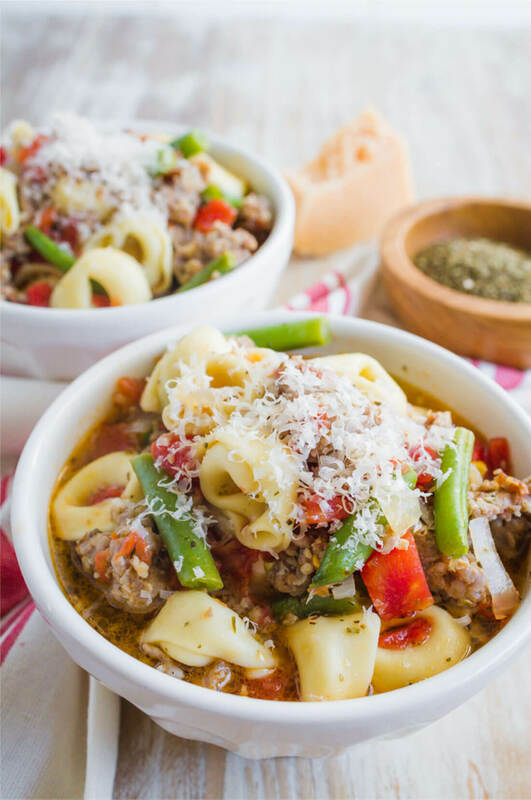 I need to try some new things in the crock pot, love tortellini, hopefully the kids will like this! I am loving all of these yummy recipes… SO GOOD!